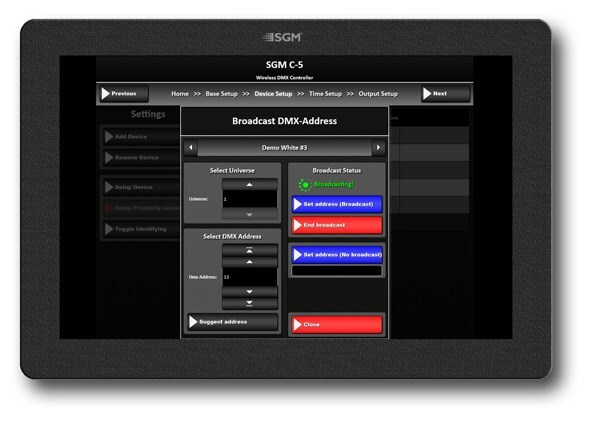 The C-5 Wireless DMX Controller is a uniquely developed piece of software intended for Windows tablets offering the user a variety of control and programming possibilities related to SGM luminaires. 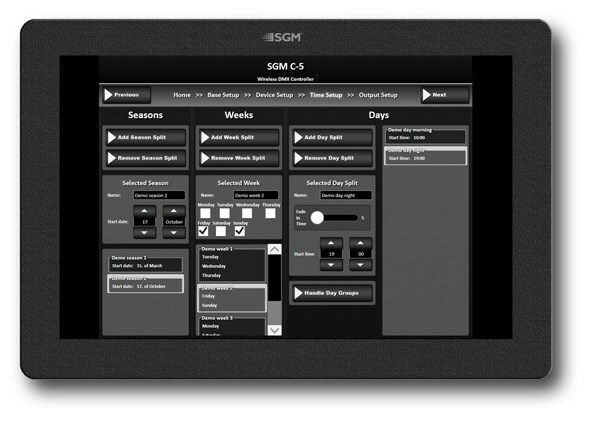 This tool gives the user the advantage of pre-programming several lighting sequences and modes or even controlling the luminaires remotely via wireless DMX. Examples include alternation in light setting per the hour, the day, the week, the month, as well as seasonal light settings, day vs. night settings, division of fixtures into groups, uniform branding of retail shops globally, etc. This ensures a very dynamic visual expression – even outside normal opening hours in for instance shop windows. Using the C-5, you can easily and remotely prepare the light setting for any environment whether it be for installations in a museum, an exhibition, a center, a hall, a trade show, a club or a shop or any other application you could think of.